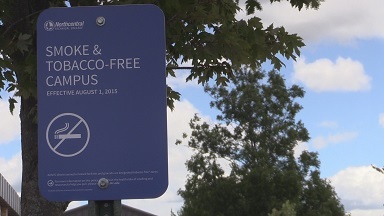 NORTHERN WISCONSIN – Many colleges across Wisconsin ban tobacco on campus. Now, Northcentral Technical College can join that group. As of August 1st, all NTC campuses banned tobacco on campus, including chewing tobacco and E-cigarettes. NTC staff sees this as a way to protect student health. The change got rid of designated smoking zones. NTC staff says student feedback has been positive so far. There will be penalties [$25 for the third offense, possible expulsion and being banned from campus] for those who don’t follow the rules. NTC campuses serve about 4,000 students. NTC is offering resources for students who want to quit tobacco use. By kristinnollmarsh in News on August 12, 2015 .